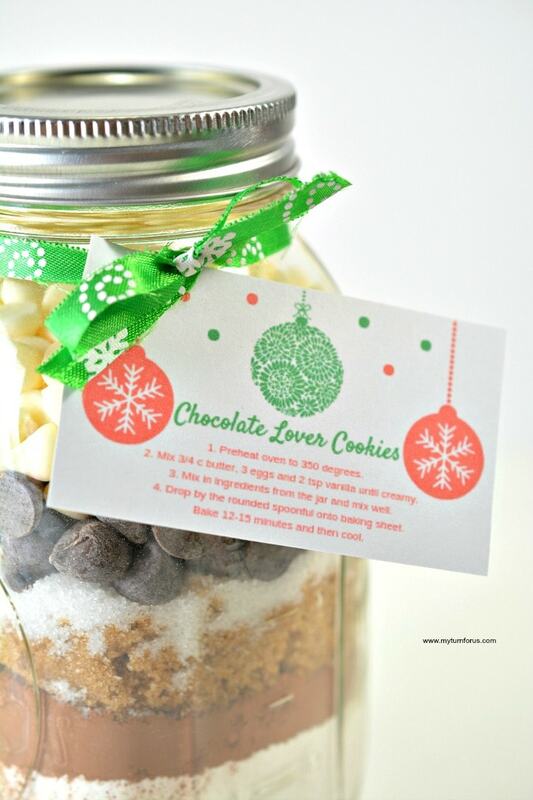 This Chocolate Chip cookie mix in a jar recipe makes an awesome mason jar cookie mix gift. 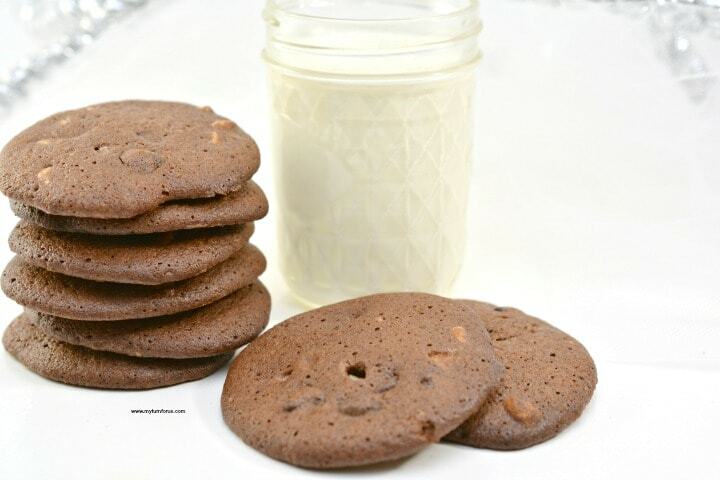 One of the best Mason Jar cookie mix recipes that make delicious triple chocolate cookies. 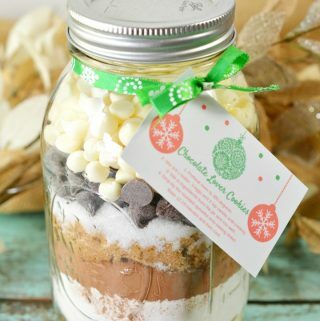 This Triple Chocolate Chip cookie mix in a jar is an awesome mason jar cookie mix gift for all those chocolate lovers out there. 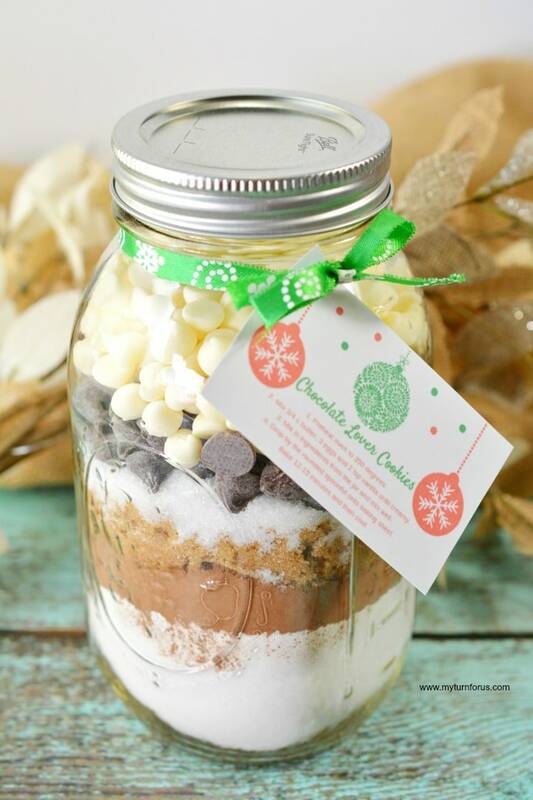 Our Mason Jar cookie mix recipe is simple, easy and inexpensive. So that makes it perfect for all your friends or coworkers for a very thoughtful Christmas gift. Aren’t these cookie recipe jars pretty? We love the display of different layers and the pretty little recipe card. We are sharing a simple step by step recipe for these mason jar gifts complete with Free printables. After filling each jar print out the recipe tags and attach to the jar with a ribbon, raffia or jute string. 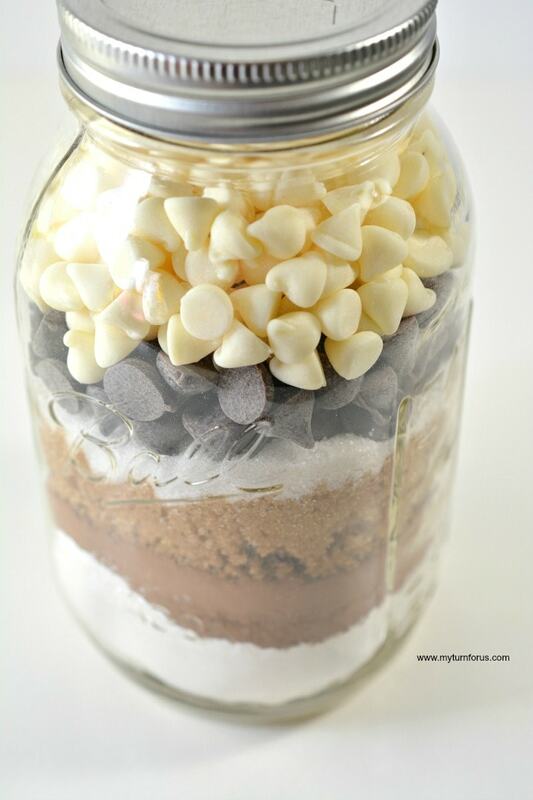 Start our Mason Jar cookie mix recipes by placing a jar funnel over the top of wide mouth quart mason jar. 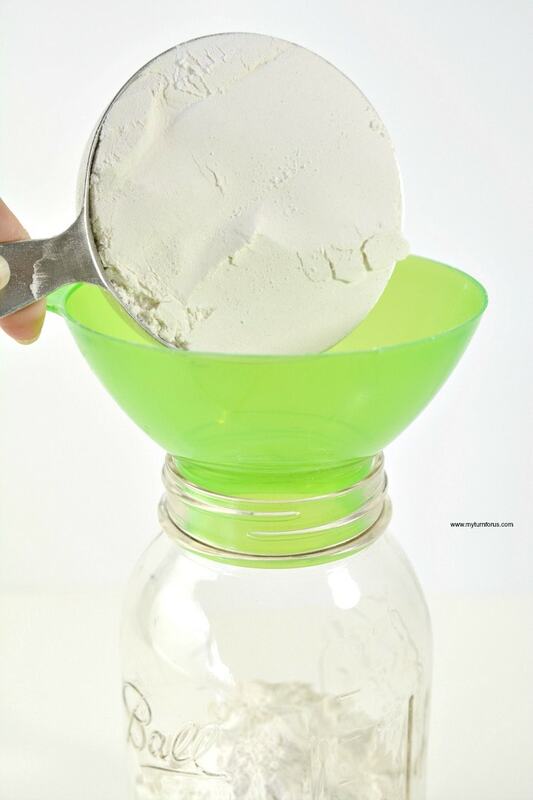 Use a dry measuring cup, add the flour first then using measuring spoons add the baking powder, baking soda, and salt. All the ingredients need to be added in the order listed and please be careful not to shake the jar. 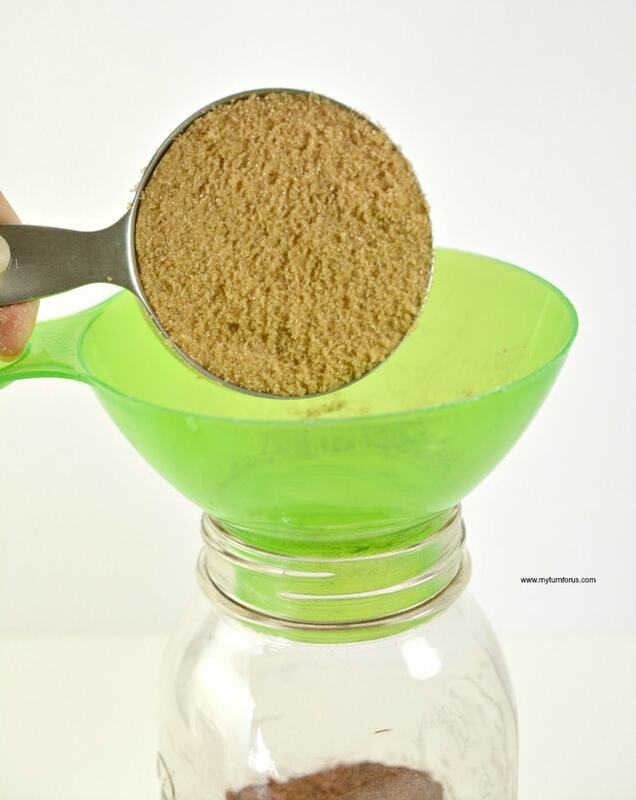 If the jar is shaken the ingredients might mix and the layer effect will not be created. Add the packed brown sugar next and white sugar and then the cocoa. So that you will have layers of the colors. 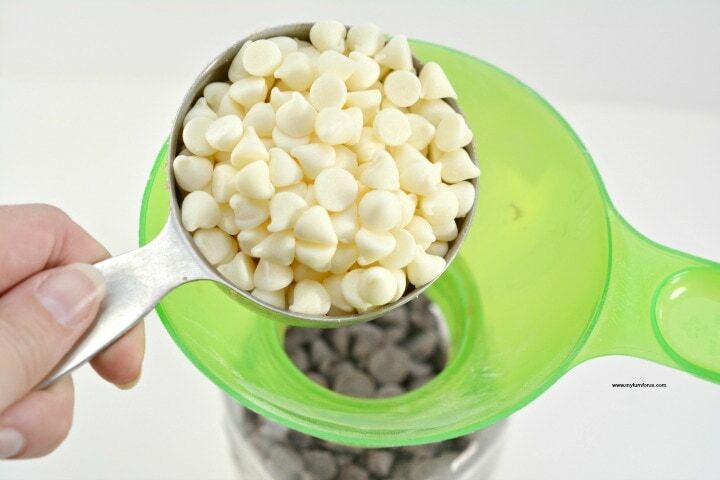 The chocolate chips can be added and then finished off with the white chocolate chips. If the jar is not quite full then add a few extra chips. 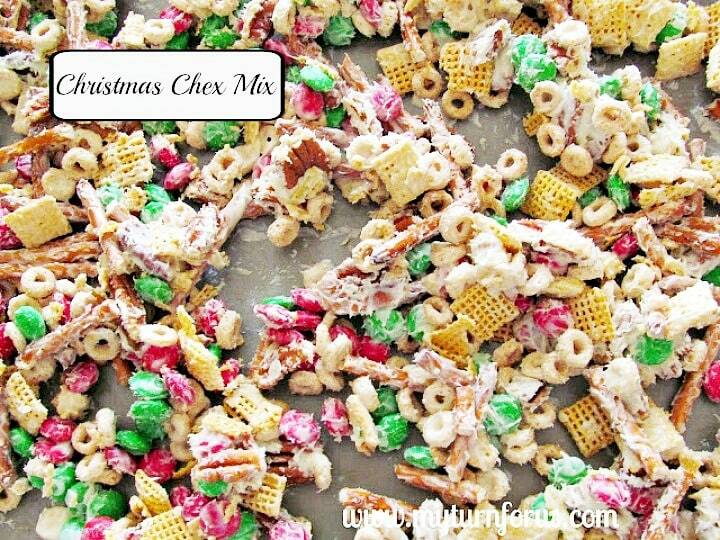 After adding all the ingredients, screw on the lid and wipe away anything that might have spilled on the jar. If you used a funnel, there shouldn’t be any mess with this Chocolate Chip cookie mix in a jar. 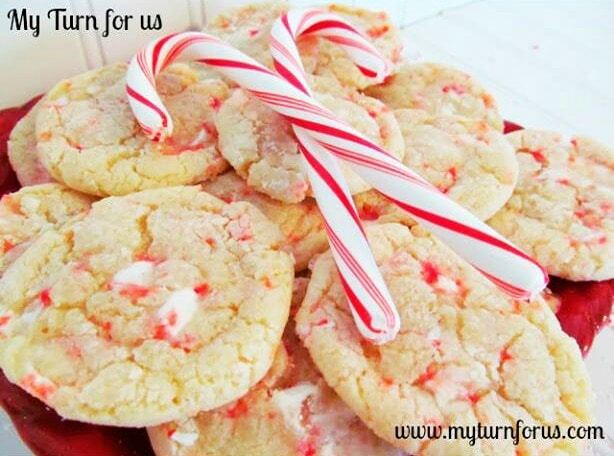 Print out Cookie Instructions from our Free Printable here. Our printable has a total of 10 recipe cards per sheet. And depending on how many jars you make, you could print out more than one sheet. Cut the printables into 10 little cards. 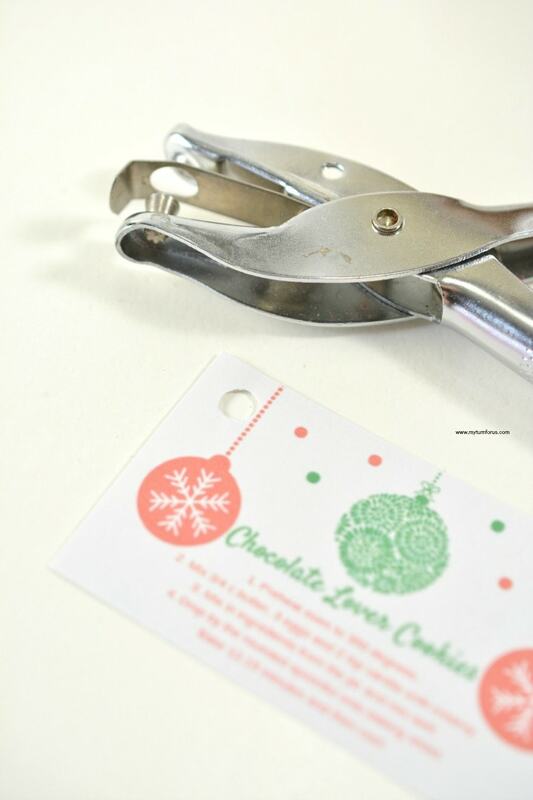 Then use a hole punch, punch a hole in the left top corner of each card. String a Christmas ribbon, raffia or jute twine through the hole on the tag. 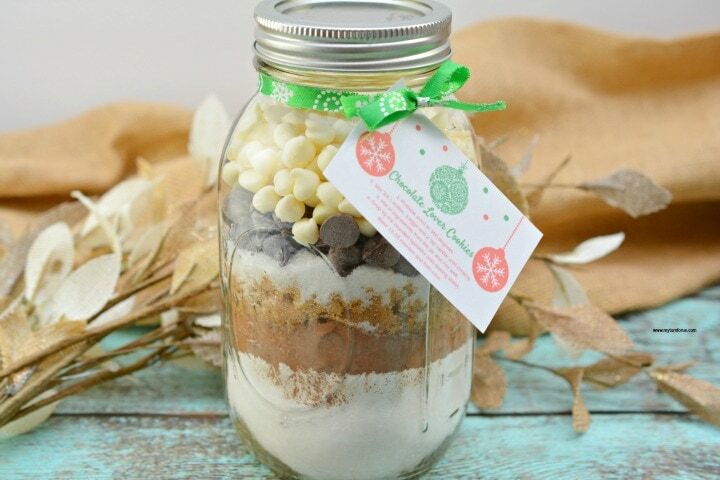 Then tie it to the top making it a super cute mason jar cookie mix gift. 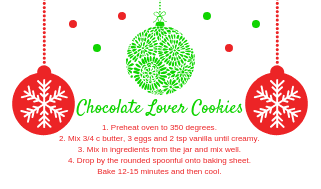 These triple chocolate cookies are the result from this Chocolate Chip cookie mix in a jar gift idea. With a funnel in the quart sized jar, add in the flour. Place the baking soda, baking powder and salt into the jar. Layer in the unsweetened cocoa, brown sugar and then granulated sugar. Add in the chocolate chips and white baking chips on top. Put the lid on the jar securely. 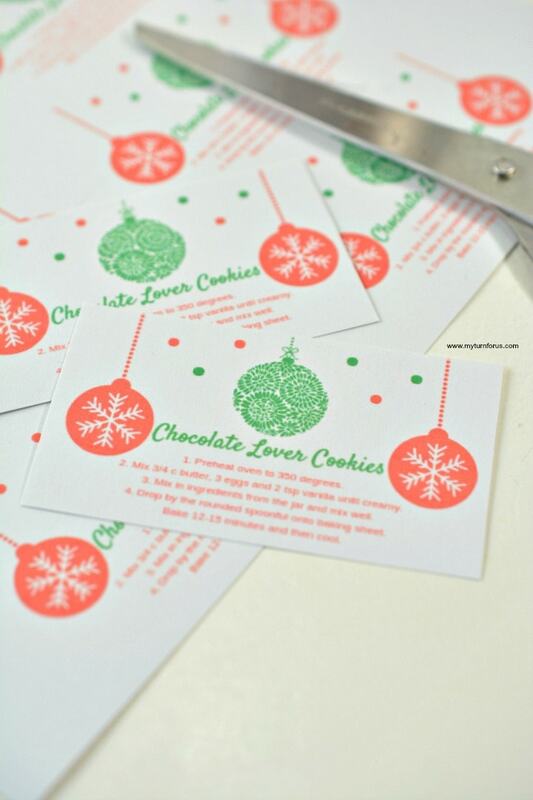 Cut out the holiday printable gift tag. Punch a hole in the upper corner of the tag. Place a ribbon or string through the hole in the tag, and tie it around the lid of the jar.